No need of convention and… children? The No.1 item on the agenda of the Verkhovna Rada’s May 15 session was ratification of the Hague Convention on Protection of Children and Co-operation in Respect of Intercountry Adoption – a key international document that regulates the procedure of interstate adoption and makes it possible to keep track of adopted children. “My personal opinion is that this bill should have been approved as a whole immediately because there are six or seven thousand gravely sick children in Ukraine, whose medical treatment requires 100, 200, or 300 thousand dollars or euros. They can be cured, but need a heavy investment. And there are potential parents who are ready to adopt a child like this and treat him or her as one of their own. I explained to my colleagues that this bill should be passed immediately, but this is a very delicate subject. The MPs failed to find an answer to the question why these children cannot be adopted in line with the existent procedure. What is bad in the latter? “I share the preoccupation and prejudice of my faction colleagues and other deputies (among those who refused to vote ‘for’ were members of not only the Party of Regions, but also of other factions). Firstly, there were media-hyped scandals over adoption of children by foreign foster parents. One more thing: the law of the countries that adopt our children not always envisages control over good attitude to children. In some cases, supervising bodies just lost sight of the adopted children. There still is a serious preoccupation that terrible things may happen to children. So it was decided to get the bill revised and put it to a vote later,” the MP explained to The Day. Asked if the opposition is going to try to move this bill on its own behalf, she answered in the negative. The politician says that the draft law is being modified and will be put to a vote again, so it is no use registering it again. The Communist Party and Svoboda factions voted against the ratification in a body. Later last year, when the office of Ukraine’s Commissioner for the Rights of Children only announced that Ukraine was going to ratify the Hague Convention. Svoboda leader Oleh Tiahnybok emphasized in a press interview that his party would adhere to one of its basic program points: the ban on the adoption of Ukrainian children by foreign citizens. Speaking to The Day last February, the Svoboda member Andrii Mokhnyk commented on this as follows: “The Ukrainian nation is quite capable of caring for its orphans.” But Ukrainian reality constantly shows the opposite. Last Wednesday Svoboda refused to support the bill in a body – quite in the spirit of its ideals. And, although these actions of Svoboda can hardly be called unexpected, experts still hoped that the situation might be changed by the attitude of the Ukrainian Greek Catholic Church which actively calls for ratifying the convention. This did not happen. Incidentally, the Convention is aimed at protecting children from illegal intercountry adoption, not at developing the practice of intercountry adoption as such. Its object is “to establish safeguards to ensure that intercountry adoptions take place in the best interests of the child” and “to establish a system of co-operation amongst the Contracting States to ensure that those safeguards are respected and thereby prevent the abduction, the sale of, or traffic in children.” The supremacy of national adoption over intercountry adoption remains in force. At the same time, the Convention also allows maintaining agreed-upon relations with the countries, which have already ratified it, in the field of intercountry adoption, as well as bringing the relevant Ukrainian law into line with international standards. And those who believe that foreigners are snatching Ukrainian orphans just from the hands of our citizens ought to read statistics. The Ukrainians prefer younger healthy children. In 2012, out of the 2,016 adopted children, 1,420 were under 3 years, 395 were aged three to five, and 201 were over 5 years. At the same time, 70 percent of those adopted in 2012 by foreigners are older children. Besides, foreigners adopt almost 20 times as many disabled children as the Ukrainians do. Foreigners adopted 120 disabled children in 2010, 139 in 2011, and 144 in 2012. 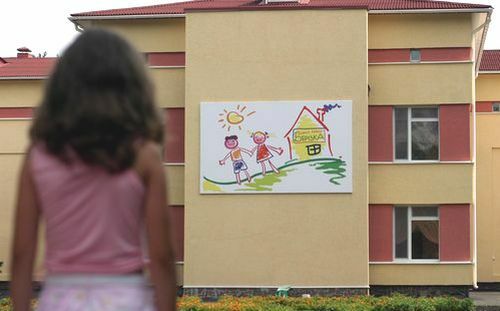 Last year 60 percent of the Ukrainian orphans and children deprived of parental care were adopted by US families, every fourth of whom being a child with special needs. In most cases, these kids suffer from Down’s syndrome, are HIV-positive, have innate heart diseases and other health problems. As of February 1, 2013, 31,574 little citizens of our country resided outside Ukraine in 34 countries. Statistics show a 20-percent annual drop in the number of foreign adoptions. There were 1,670 Ukrainian orphans staying abroad in 2007 and only 806 in 2012. In other words, taking a seemingly patriotic stand centered on the rights of the child, Ukrainian politicians are in reality opting for indifference and inhumanness towards orphans. Is this really patriotic? What comes to mind here is the Kremlin and its “Dima Yakovlev Law” which forbids the Americans to adopt Russian orphans, and the retaliatory “Magnitsky List.” That law is also wrapped into patriotism, but it is filled with bitter stuff. At present, the destiny of Ukrainian orphans also directly depends on political games, and their interests are low in the list of priorities under the Verkhovna Rada dome.